Secret Romance is a 15 pay-line video slot machine that has five reels that offer you a lot of winning chances and bonus features that will make sure your stay is well-rewarded whenever you spin the slot. The new online slot by Microgaming has a romantic theme that it delivers in outstanding visuals and symbols that will make sure you enjoy an immersive and engaging gaming experience. You will be able to play the slot machine here to see what it has to offer you for fun with demo credits before you play it for real cash at any Microgaming powered online casino. 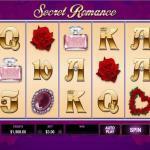 Secret Romance is a five reel slot machine that has fifteen stake lines by Microgaming. The online slot comes with a romantic love theme, and you will be able to enjoy that idea with stakes that vary between 0.15 and 15 credits for each spin. 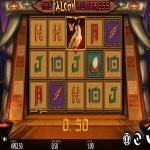 You will also be able to enjoy the slot machine on desktops, tablet devices, mobiles and more. 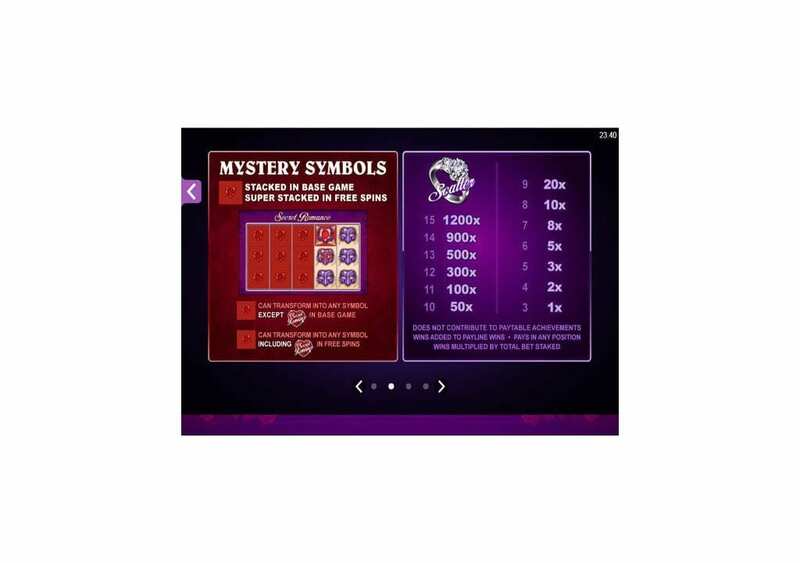 The online slot does not only come with fifteen rewarding paylines, as it also comes with Free Spins and the Mystery Symbols features. The timeless romantic love theme is going to allow you to slip into something more conformable as you relax, spin the reels and enjoy the love. The visuals help spread that love with purple colors, roses, hearts and other romantic symbols. So while Secret romance is by far, not the best slot by Microgaming, but it is a decent one that you will have a lovely time playing. So if you are in the mood to relax, have a glass of wine and enjoy a simple and a rewarding slot, then Secret romance is the online slot for you. 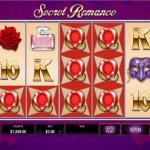 Secret Romance by Microgaming offers you a love-filled experience that will relax you and reward you. While there is no strong story behind the theme, you can say that it somehow revolves around Valentine’s Day, since it is all about love and romance. Valentine’s Day, also known as Saint Valentine’s Day as well as the Feast of Valentine is a holiday that people celebrate on the 14th of February. It started as a liturgical feast by the Western Christians that honored a saint named Valentinus. Now, it is a significant commercial and a cultural celebration in many countries around the world that celebrates love and romance. 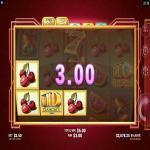 That is that this online slot machine is all about, love, passion, and romantic gestures. Therefore, you will see a lot of roses, hearts, perfumes and more on a purple heart-patterned background. The online slot machine at hand is all about romance, and therefore, you will find a lot of romantic items appearing as symbols on the reels of the slot. These symbols include roses, hearts, perfumes, masks, a diamond ring, a precious ruby stone, a Heart with Roses. These symbols are the high paying ones; as for the low paying symbols, they come in the shape of the golden playing card symbols. Secret Romance has a format of five reels that host fifteen stake lines with three symbol rows. The reel set takes place on a purple background with a heart-shaped pattern. The control panel is underneath the reels; it is where you will be able to spin the reels, determine the stake and control the Auto Play function. As for the settings and the paytable, you can access them by clicking on the three stripes button on the top left area of the reels. All in all, the online slot has fantastic visuals with romantic sound effects that will immerse you in the theme for a great experience. 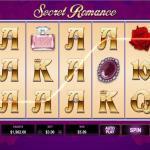 Secret Romance provides you with an RTP of 96%, which means that the online slot is pretty rewarding. So whenever you decide to give the reels a few spins, you are guaranteed plenty of rewards. You will be able to open the paytable of the video slot to view the line prizes as well as the features by clicking on the settings button on the top left then the paytable. You will need to get three matching symbols on the same line to claim a prize. The highest payout that you will be able to claim is equal 350. You can earn this award when you get 5x of the wild Logo of the slot machine on the same line, on the five reels of the slot. Secret Romance by Microgaming is a highly rewarding online slot that has a lot of winning chances in addition to bonuses. There is a wild, a scatter and free spins. 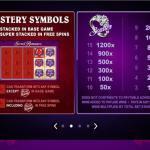 He Heart-shaped logo of the online slot machine is the wild icon that is going to help you create the best payout possible whenever it lands on the reels. It will do that by replacing any of the other symbols on the lines, except the scatter symbol. The Scatter Diamond is the scatter symbol that can give scattered rewards. You will also be able to enter the free spins round when you get three of these scatters on the reels. 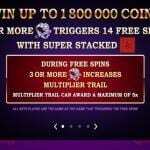 You will claim a total of 14 free spins. 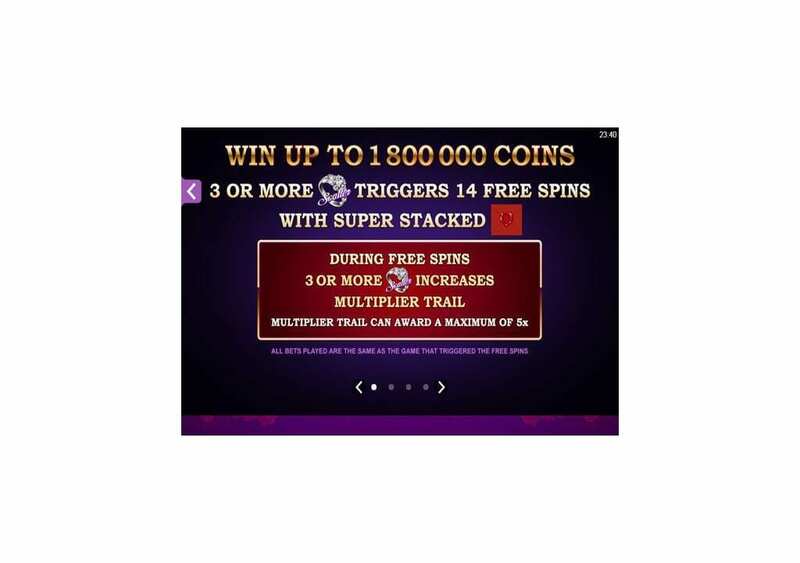 During the free spins round, there is a multiplier trail that can help you claim high rewards. That multiplier trail can amount up to 5x.